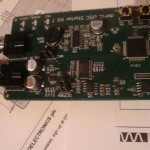 A couple of posts below i mentioned about Wolfson WM8510 audio codec used in the Microchip’s DCS Starter Kit. In the demo files found on Microchip’s webpage you can find a driver for this codec written in C but it only has config defined for 8kHz and 16kHz which ofcourse it is very very low for any hi-fi standard. This doesn’t mean the chip can’t do better. 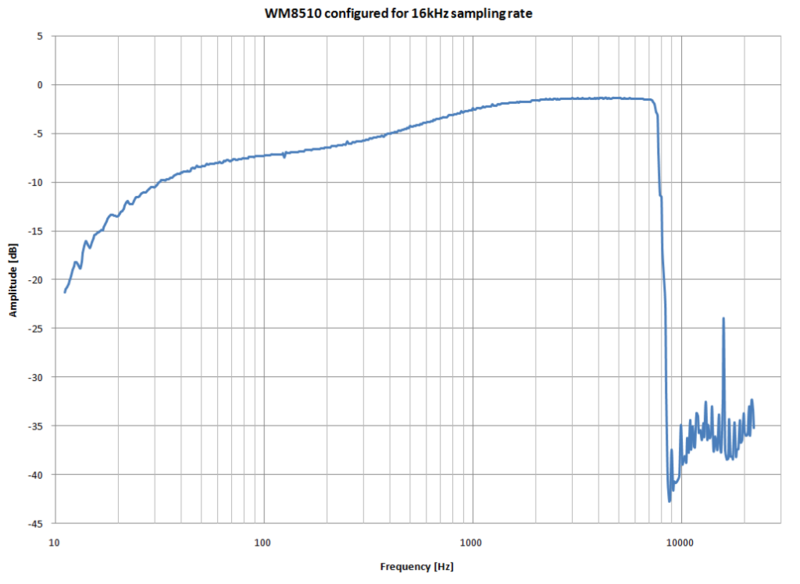 First thing we will need the datasheet of the WM8510 which can be found here. At page 65 you will find [Register Bits by Address] and this is a very helpfull map around the device’s registers. This will write 000000100 bits in WM8510_INPUT_CTRL register. All register names are defined in WM8510CodecDrv.h and each name has a decimal value attributed. 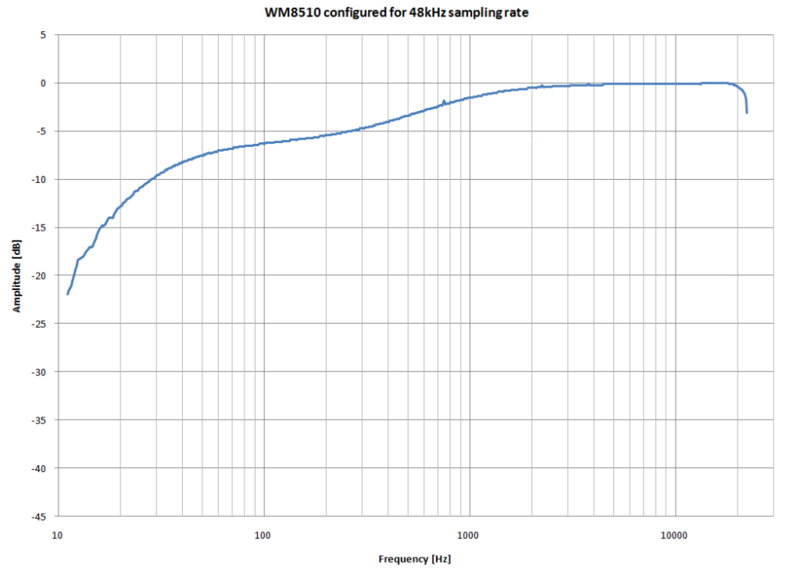 This decimal value coresponds to the Register Address from page 65 in the WM8510 datasheet. Why write two different values in the same register in consecutive instructions beats me. So in order to configure WM8510 for 48kHz sampling rate we will need to create one more function and add it to the WM8510CodecDrv.c, basically copy paste from the 16kHz one and then modify it, or just copy paste whats below. Remember to backup your files first and read the disclaimer :). After this the chip is configured to work at 48kHz sampling rate and 16bits word length. To modify it for 24bits you need to modify bits 6:5 to 0b10 from register 4 or WM8510_AUDIO_INTERFACE. 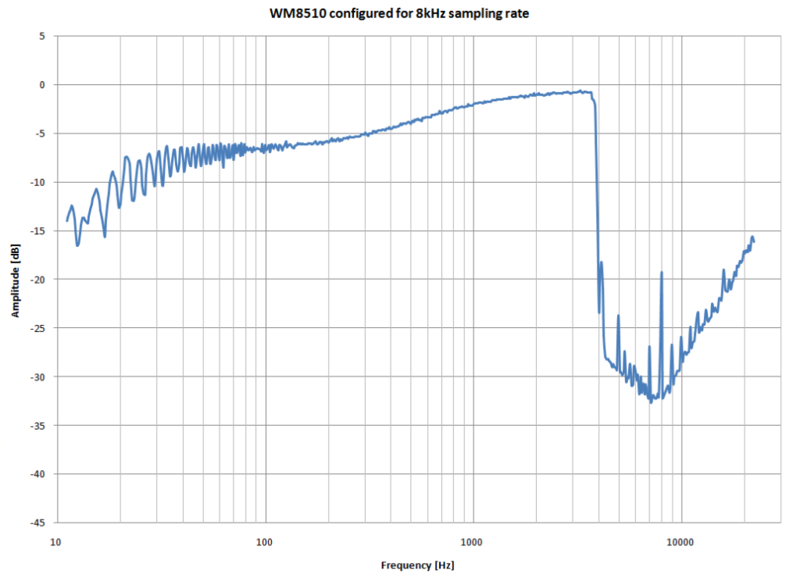 For 48kHz sampling rate first you need to modify bits 3:1 to 0b000 (default value actually) in WM8510_ADDITIONAL_CTRL (R7) register, bits 7:2 in WM8510_CLOCKGEN_CTRL (R6) to 0b000000 and bit 4 in WM8510_PLL_N (R36) to 0. Looking through the register map you can see many usefull functions like an input mixer, gain control, level control, output selection, some filtering capabilities. You can modify all these registers in main.c by calling WM8510IOCtl() function. After you added the 48kHz config in the driver .c file you will also need to replace the WM8510SampleRate8KConfig(codecHandle); with WM8510SampleRate48KConfig(codecHandle); in main.c. Happy coding and thanks for visiting.